(CNN) -- Former winner Danilo Di Luca has taken over the race leader's pink jersey after finishing second in Wednesday's punishing fifth stage of the Giro d'Italia. 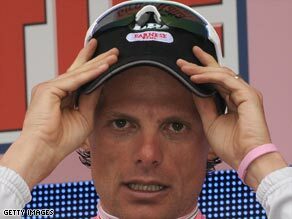 Di Luca snatched the race leader's pink jersey after finishing second in Wednesday's fifth Giro stage. Di Luca, the 2007 Giro champion, finished two seconds behind Russian Denis Menchov on the relatively short 125km stage from San Martino di Castrozza to Alpe di Siusi, which involved a 25km ascent to the finish, a gruelling climb which blew the peloton apart following-on from Tuesday's mountain top finish. Crucially for Di Luca, he finished three seconds ahead of Sweden's Thomas Lovkvist, who took the pink jersey on Tuesday, allowing him to lead Lovkvist by five seconds in the overall classification -- taking into account time bonuses for the first three riders home. Meanwhile, seven-times Tour de France winner Lance Armstrong suffered on the final climb, losing almost three minutes to the first three home. "I'm definitely a little tired, it's a hard climb and we knew that we'd be behind," the American told Rai TV. "We just said ride tempo and try to limit the losses. I thought it may be two minutes but it's closer to three minutes but I'm OK with that. I've always said the first half is not going to be mine, I've still not got my condition back after my accident and I can't expect to be at the front." However, Armstrong was not the only big name who suffered on the final climb, with former winners Stefano Garzelli, Damiano Cunego and Gilberto Simoni, as well as top Italians Maurizio Bruseghin and Franco Pellizotti, all dropping back. Going into the final kilometer, the lead group had been whittled down to seven riders, with race favorite Ivan Basso among them. Tour de France champion Carlos Sastre attacked first but Rabobank's Menchov surged past him with Di Luca struggling to keep his wheel and Lovkvst coming home in third. Basso finished fourth with Levi Leipheimer, Armstrong's Astana team-mate, in fifth. Australian Michael Rogers finished ninth on the stage and is third overall, 36 seconds behind, while Leipheimer is up to fourth in the general classification with Menchov up to fifth.